How to convert documents of HTML to WMF? If you need to convert document of html to wmf, you can use the product of VeryPDF—Document Converter, with which you are able to convert any printable documents to image formats, of course including html to wmf. Document Converter can be used in many people for different purposes because it has three versions—GUI version, command line version and virtual printer version. The GUI version suites to convert many documents to images, which means the batch conversion. The command line version can be used as a tool when you want to develop software. The virtual printer version can be used to print documents and enables you to save paper and ink. The virtual printer application docPrint also able to be used as a document converter for its friendly interface and easy-to-use way. To use docPrint, you should download Document Converter at http://www.verypdf.com/artprint/docprint_pro_setup.exe first and please install it on your computer. In the installation directory, you can see the GUI version and command line version. In the printer list when you click “Start”—“Printers and Faxes”, you can see the virtual printer application docPrint. At the beginning of the conversion from html to wmf, you should run the printer driver. If you have set docPrint as the default printer on your computer, please right click the HTML document and click “Print” option in the dropdown list to directly run docPrint. On the contrary, you should open the HTML document with some kind of browser and click “File”—“Print” or press “Ctrl”+ “P” on the keyboard to open the “Print” dialog box. Then you should choose “docPrint” as the current printer in “Printer” combo box from many installed printers. Then please click on “OK” button. Next, through the popup docPrint main window, you should open the “Save As” dialog box in which you can use several methods for this purpose. 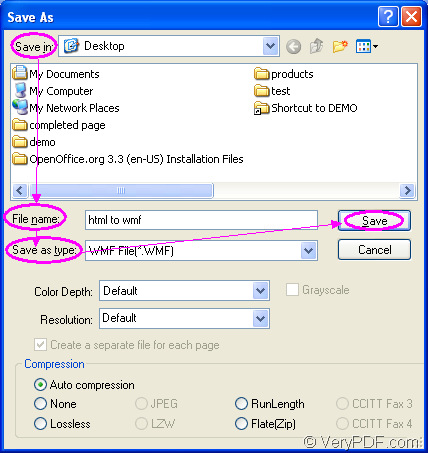 You can click “File”—“Save as” to open the “Save as” dialog box or click the “Save File” button in the toolbar to open the dialog box. The hot key “Ctrl”+ “S” on the keyboard will also do you a great favor. At last, please save your target file in the “Save As” dialog box in which you can see some combo boxes and one edit box. Please finish the following operations to save the target file. In “Save in” combo box, you should choose the location for the target file. In “File name” edit box, please input the name of the target file. In “Save as type” combo box, you should choose the right output format and then please click on “Save” button. Please see the “Save As” dialog box in Figure1. Several seconds later, you will see the target file in the specified location and you can browse it with some kind of image viewing or processing program such as Photoshop, IrfanView, etc. How to convert HTML to WMF? How to convert html to wmf format? How to convert a document of html to wmf? How to print documents of MS Office to ps? How to convert Webpage to WMF? 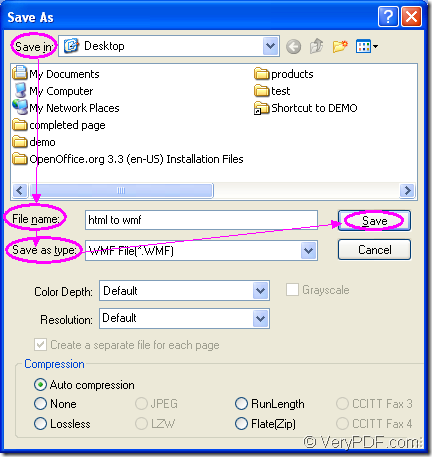 How to convert documents of Microsoft Office Excel to JPEG? This entry was posted in docPrint Pro and tagged html to wmf. Bookmark the permalink.